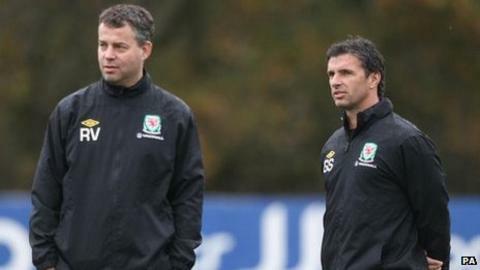 Gareth Bale has backed assistants Raymond Verheijen and Osian Roberts to remain part of Wales' management set-up following Gary Speed's death. Verheijen was Speed's assistant and Bale thinks the Football Association of Wales should give the backroom team a chance after Speed's death in November. Tottenham star Bale said it would be "absolutely ridiculous" to make significant management changes. He added: "I know personally most of the players want to keep it the same." Manchester United veteran Ryan Giggs has been linked with the role and been offered a new one-year deal at Old Trafford. Bale says he hopes the Football Association of Wales give their backing to his stance and that of the players he believes agree with him as they look forward to the 2014 World Cup qualifying campaign that starts in September 2012 against Belgium. "It's a massive blow for everybody [Speed's death]," said Bale. "Nobody expected it at all, but I think we would definitely want to keep the same set-up. "Raymond's done a fantastic job with Gary Speed and yeah, we want to keep it that way. "Hopefully all the board members, all the FAW members will see sense and we've got a major tournament around the corner and we're playing some great football and we're getting actual results. "So hopefully they've realised that that's happening... and I know personally most of the players want to keep it the same. "Hopefully they... make sure that we can carry on Gary Speed's legacy and what he wanted us to do." Bale is unsure as to whether or not another figure could or should be brought into the set-up. But he added: "I think we definitely need to keep Raymond and Osian and the team around them, even the medical staff, all the fitness people. "Everything at the moment is perfect and we're playing the best football we've ever played. "We're getting big results which we've never really done before and we've got a major tournament around the corner. "And it'll be absolutely ridiculous to change anything now because it'll take us a good year or two to get us back up to where we are now and hopefully the FAW can come to their senses and stick with what we've got." Verheijen, 40, who has helped coach Netherlands, Russia and South Korea at World Cups, wants to continue alongside fellow coach Roberts. The Welsh FA hope to name a successor to Speed ahead of their next game. That is expected to be a friendly with Costa Rica in Cardiff on 29 February in what will be an emotional first international fixture since Speed's death. The FAW plans a special tribute that night to the former manager, captain and most-capped outfield player. The Welsh FA has yet to confirm the process for appointing Wales' 13th full-time manager will be appointed. The FAW charged a six-man managerial panel to appoint a successor to John Toshack in 2010, the job Speed eventually took. Verheijen has made no secret of his desire to remain involved with Wales alongside Roberts. "Hopefully the board will respect Gary's wish so [fellow assistant] Osian Roberts and I can lead the team to Brazil," Dutch coach Verheijen wrote on Twitter on 11 December, 2011. "There is no need for a new manager with new ideas. Our success was based on Gary's clear structure. Everybody knows what to do for mission Brazil 2014." Despite a difficult start to his reign as manager, Speed won four of his last five matches in charge.